When it comes to getting a great vocal, there is no substitute for recording a great vocalist. However, not all music producers or media composers have the budget or time (deadlines!) to do so. In these circumstances, sampled vocals — whether simple loops or more sophisticated virtual instruments — provide a pragmatic solution. 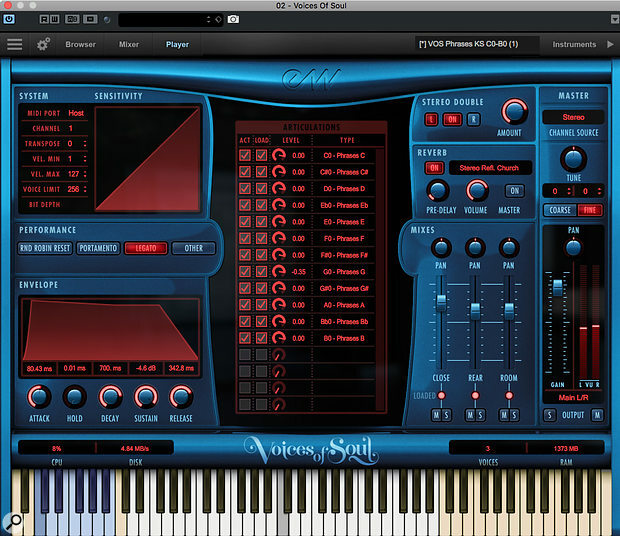 Virtual vocals come in various formats from oohs and aahs, vocal phrases (word-based or vowel-based) and even vocal synthesis (for example, Zero-G's Vocaloid). There are lots of choir-based options and a good number of loop-based libraries that offer genre-specific solutions, but, outside conventional choirs, there are relatively fewer high-end virtual instruments. Those needing a 'vocals in the box' solution will therefore be interested in EastWest's latest release: Voices Of Soul. Voices Of Soul is delivered as a 13GB sample library for EastWest's Play front-end. Licensing can be done via a single, one-off payment or as part of EastWest's subscription-based Composer Cloud. All the vocal performances come curtesy of CC White. Her CV includes working alongside Jason Mraz, Lenny Kravitz, Jackson Browne, Barry White, Taj Mahal, Joseph Arthur, Joe Cocker and... well, you get the idea; this lady can sing. And, while her roots are firmly in Gospel and Soul, EastWest are keen to point out that the performances captured here will work in other styles including Funk, Reggae, Jazz, Southern Blues and even Latin. 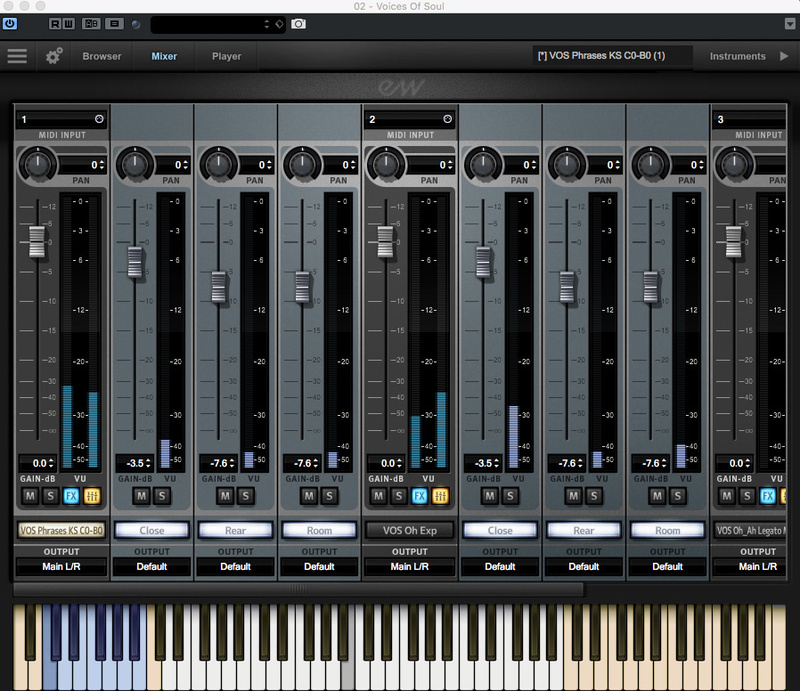 The Play front-end, which currently stands at v6, runs as either a stand-alone product or as a plug-in (I ran it as a VST plug-in inside Cubase Pro 10 but AU and AAX are also supported). With all samples presented at 24-bit/44.1kHz, Voices Of Soul offers over 70 multi-sampled presets organised into a number of distinct categories. 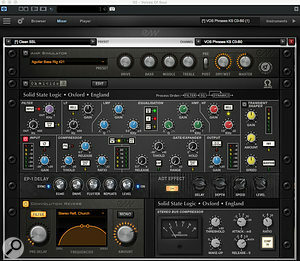 As described more fully below, a full range of effects options are available in Play including both reverbs and delays. However, all performances were also recorded via three different microphone positions — Close, Rear and Room — so you have plenty of control over the ambience. The presets are divided into eight categories and, broadly, these fall into sustained vowel-based types and sung phrases. The sustained vowel-based presets come in various forms and, while we may have all heard rather too many mechanical‑sounding 'ooh' and 'ahh' vocal presets in our time, that's absolutely not what we get here. Some of this is undoubtedly down to the wonderful character of CC White's voice. However, there is also some very impressive sample handling that enables very expressive and realistic results to be obtained. Don't be fooled by these seemingly simple single-vowel presets; they can produce some very realistic harmony backing vocals.For example, even in the most basic single‑syllable Sustain presets, there are velocity sensitive dynamic layers and subtle performance differences between each pitch. While this means very natural sounding single‑note lines, it is particularly effective for harmonies because the differences in performance really do make it sound like multiple takes and/or singers. In addition, a few of the Sustain presets come with added 'expression' (different scoop into the note and different vibrato). With loudness controllable via CC11 in these single‑vowel sounds, they really are a joy to use. The Legato presets, while smaller in number, are just as good. The velocity layers provide some performance variation and the legato transitions ± one octave are very smooth once you get used to triggering them. Some presets also offer mod wheel-based switching between different vowel sounds. The Combo MOD, Combo RR and MOD Xfade Chords presets, while all offering single‑vowel type performances, take the control options further. The Combo MOD presets provide mod‑wheel switching between different vowel sounds, while the Combo RR presets use round‑robin sampling to cycle through different vowel sounds. The MOD Xfade Chords presets are designed more with chordal/harmony use in mind. These presets use the mod wheel to crossfade between mp (medium-soft) and f (loud) articulations, although some care is needed as you use the crossfade given the differences between these articulations. CC11 can again be used to control actual volume. The 12 Phrases presets are vowel-based melodic phrases sung to a specific root note (A, Bb, C, etc). However, the phases themselves — and there are over 600 in total — are all unique rather than simply repeated at different pitches. It's within these phrase presets that CC White's voice really shines. Yes, you have to carefully match the melodic lines and tempos with whatever your backing track might be doing, but that's true of any melodic source sample. In this case, however, it's well worth doing; this is super-soulful stuff. Play's Mixer page is simple and easy to use.The phrases themselves vary in nature. There are short shouts and falls and longer phrases with lots of melodic variation. Perhaps the most obvious way to describe them is as perfect vocal ad-lib content but with loads of attitude and sass. Stylistically, things are dominated by soulful and blues-tinged performances so, while the single‑vowel presets might find a home in quite a wide variety of musical contexts, the phrases are perhaps a little more genre-specific. Of course, EastWest have also provided a set of keyswitch presets. Three presets provide access to the full range of options for the sustained vowels, legato vowels and phrases. 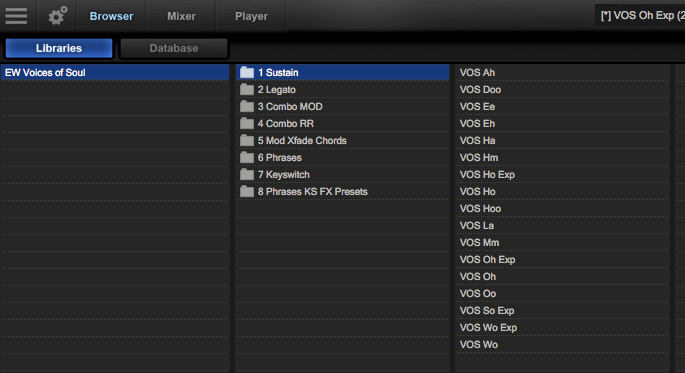 A separate folder of phrase‑keyswitched presets is also included, with a variety of effects pre-applied. If your keyboard skills are up to the task, you can easily 'perform' using any of these keyswitched presets or simply program in keyswitch changes as part of your MIDI sequence. 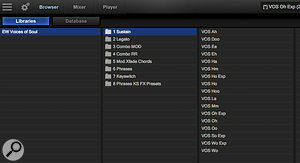 As with any multi-sampled, keyswitched virtual instrument, these presets are the most RAM‑hungry amongst the library. For example, with the default Sample Cache setting of 3 in Play 6 on my test system, the three keyswitch presets required 608MB (sustained), 1042MB (legato) and 491MB (phrases) respectively. Play does, however, provide you with ways to adjust the balance between RAM use and the streaming load from your hard drive. As shown in the Player page screen, you can unload particular articulations within a preset if you are not using them and wish to conserve RAM. Play itself has, of course, been described fairly thoroughly in SOS reviews of other EastWest titles, so I'll just mention the obvious highlights here. On the Player page you get access to features such as a amplitude envelope, convolution reverb, volume and pan. However, there is also the Stereo Double option and access to the three microphone positions mentioned earlier. Usefully, you can choose to unload the samples for any mic positions you don't need. Play also gives you a CPU usage estimate. For what it's worth, an instance of Play seemed to idle at 3 percent on my test system, going up to 4 or 5 percent with a few notes playing. 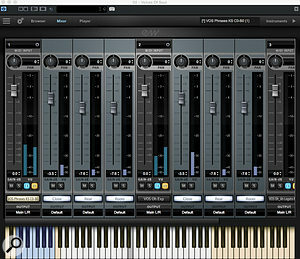 Amongst Play's effects options, the EP-1 Delay and ADT Effect are new for Voices Of Soul.Some of these controls are repeated on the Mixer page. However, if you hit the tiny FX button in the main Voices Of Soul output channel, then you get access to Play's full array of effects options. Of most interest in a vocal context is the SSL Channel Strip and SSL Bus Compressor. Both are excellent. You also get to dig into the convolution reverb in more depth here with low/high EQ roll-off. Two of the effects modules — the EP-1 Delay and ADT Effect — are both unique to Voices Of Soul. The ADT is quite subtle but sounds good. However, for me, the star of the show is the EP-1 Delay, based upon the classic Echoplex tape-based delay, which sounds wonderfully old-school in this emulation. There are, of course, all sorts of other technical things you can tweak under Play's hood, but the bottom line is that this is a very polished front-end. Working any sample-based vocals into an existing musical arrangement always requires a bit of care, whether it is matching the tempo (vocal attack can be important here) or key/scale. That said, in use, Voices Of Soul does its best to make life easy for you with the various different vowel presets each having their uses and the collection of phrase samples covering all 12 semitones. I have to say that the vowel samples provide one of the best 'virtual' backing vocal options I've ever used. If soul (obviously! ), blues, R&B or pop are your thing, Voices Of Soul will allow you to create some very realistic, human-sounding, harmony parts. When it comes to vowel-based melody lines, though, the phrases in Voices Of Soul can be truly spine-tingling. Yes, as supplied, the phrases are predominantly soulful and blue and it is obviously easier to start with a vocal line and build a backing track around it. I also had no problem when rendering a melodic line crafted with Voices Of Soul and then applying pitch manipulation to re-write the melody. Tempo adjustment could obviously also be applied within the limits of whatever tools you have available. In short, if you are prepared to get hands -on with some tempo/pitch editing, there is plenty of additional mileage to be had out of what is already an impressive collection of phrases. Within its target genre, Voices Of Soul is one of the most impressive vocal sample libraries/virtual instruments I've had the pleasure to use. While there is special launch pricing, at full price it is perhaps one for the more serious composers or music producers, although EastWest's monthly Composer Cloud subscription allows almost anyone spread the financial load. With the combination of CC White's fabulous vocals, and some well-thought-out sampling, Voices Of Soul makes for a very expressive instrument, and I fully expect to hear some (virtual) CC White vocals on a chart-topping track or TV/film score very soon. There are lots of vocal-based sample libraries and/or virtual instruments available, but relatively few as comprehensive as Voices Of Soul that lie outside the classical choir genre. 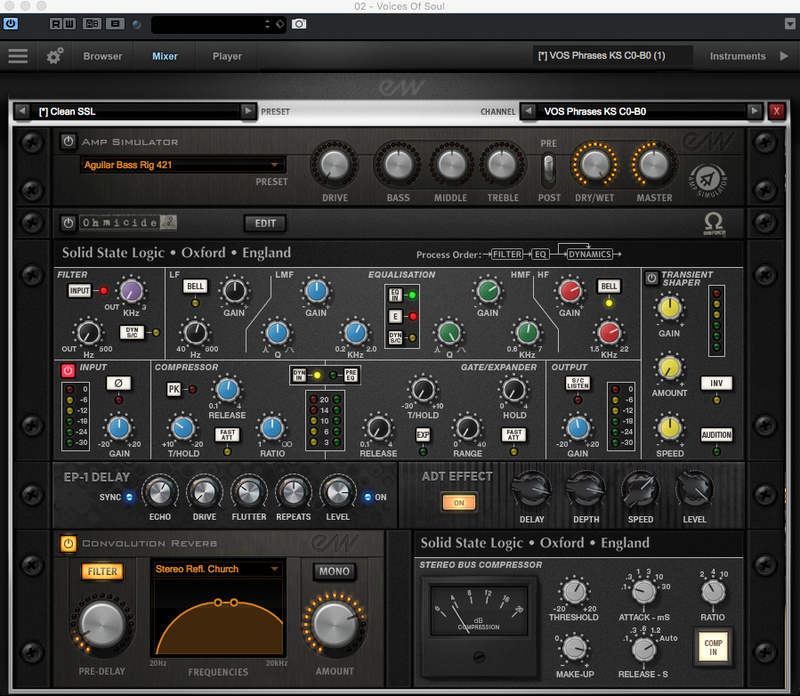 However, Zero-G's Ethera Soul Edition provides a more budget-friendly option with both phrases and sustained presets, while Big Fish Audio's Vintage Vocals is in broadly the same musical field and provides good options for backing vocals. If you want to go back in time, then Spectrasonics Vocal Planet — long since a legacy product but you might find it second-hand — has both gospel and jazz/blues sections with some excellent sung phrases. Capable of creating some very expressive and realistic performances. CC White's voice is fabulous. Just the usual practical constraints of working with any sample-based vocal. Price will put it beyond the reach of some. For vowel-based backing vocals, Voices Of Soul is capable of some excellent, expressive, results while the phrase samples demonstrate the soulful beauty of CC White in full flow. This is impressive stuff and full of character. $199 introductory price, normally $399, or via Composer Cloud subscription starting at $24.99 per month.